Championship golf course with spectacular coastal views and considered one of South Australia's best. 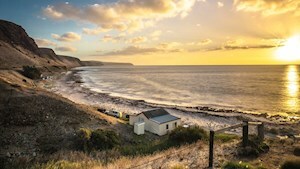 Five kilometres south of historic Normanville is beautiful 'Lady Bay'. Not officially named a town, it is the colloquial title given to a settlement of shacks built half a century ago. A long stretch of Norfolk pine trees separates the coast from land providing many choices of picnic spots. Where the road leaves the coast and heads into a gorge you will find a lookout with a memorial to the ex-HMAS Hobart that was scuttled offshore. 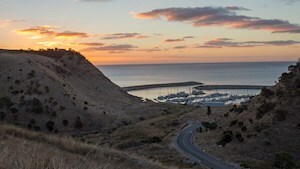 Lady Bay is home to a resort, which includes luxurious studio apartments, a restaurant, bistro and conference facilities, as well as a championship golf course with spectacular coastal views and considered one of South Australia's best. See what people are posting about Lady Bay.